Imagine the rich and the famous gathered at a gorgeous wine estate eating lunch and bidding against society’s stylish superstars for stays in a beach paradise (helicopters and butlers included) and cases of wine from France’s Loire Valley. Pretty stellar, huh? Now add the fact that all money raised goes to supporting education in the Winelands and you might as well describe the good vibes created as intergalactic. 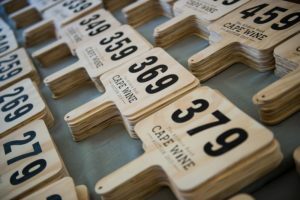 The Cape Wine Auction, the next of which is scheduled for February 10 and 11, is quite a party at the same time as being so much more than a party. 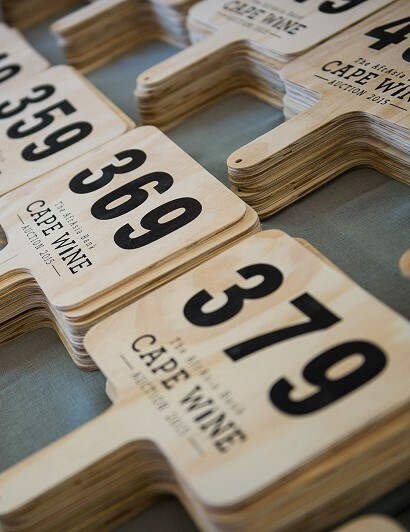 Mingling with international and local stars and sophisticates and bidding for fabulous lots definitely has its allure but, the organisers say, the real shine is added by the fact that money spent on the day will make a profound impact on the lives of children in the Cape Winelands. 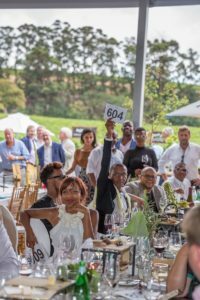 The auction was established in 2014 and, according to auction director Darielle Robertson, the success of raising R31 million in just three auctions is certainly at least partly due to the model for maximising the benefits of giving back. “The proceeds, without offset or deduction, go to the 22 beneficiaries actively involved in the Winelands, offering education, meals, after care, counseling services, career placements and training,” says Robertson. She believes that this model is one of the main reasons guests come back year after year and pay quite healthily for the privilege to attend. Tickets cost R1,850 per person for access to the Friday evening barrel auction and R5,000 per person for both the Friday and Saturday events. “We believe that our guests come back every year not only for the auction experience, but because they know that they are supporting an initiative that is making a real difference in breaking the cycle of poverty and empowering children with education and the chance towards a bright future,” says Robertson. Sponsored by American Express, the barrel auction allows collectors to taste directly from the barrels of once off, specially curated and limited release wines in the company of the winemakers, and bid on them. The Nedbank Private Wealth Auction on the Saturday is a grand luncheon with local and international personalities bidding for the 35 bespoke lots up for auction. The lots, all of which are donated, include “diverse experiences and rare opportunities”, the novelty of the collections bringing guests back, according to the organisers. One lot includes an all-inclusive seven-night stay on Azura Benguerra Island, just off Mozambique, for four people. The stay includes helicopter transfers, butler service and 15 cases of wine from Château Pas de Loup in France’s Loire Valley. Included in another lot is the opportunity for six to spend a two night, all-inclusive stay at Christo Wiese’s exclusive private game lodge in the Kalahari in the company of the great businessman himself. This comes with a private tasting at his Lourensford Wine Estate and 24 bottles of wine. Rare wines are incorporated in some of the lots. Last year a record was broken when the first bottle of Touch Warwick Cabernet Sauvignon 2014 together with a luxury golf tour with local celebrity Tbo “Touch” Molefe and the initiator of the Cape Wine Auction and managing director of Warwick Estate Mike Ratcliffe, was sold for R1.3 million. The beneficiary partners of the Cape Wine Auction are: The Pebbles Project, MAD Leadership Foundation, The Click Foundation, Community Keepers, Maranatha Trust, Pinotage Youth Development, Wine Training SA, The Kusasa Project, Hope through Action, Aitsa After Care Centre, Eduvate, Hemel & Aarde Community Project, Cape Winemakers Guild, International Wine Education Centre, Love2Give Skills Academy, The Lunch Box Fund, Sparks School International and the Anna Foundation. Spark Lynedoch, on the outskirts of Stellenbosch, is an example of a success story where the Cape Wine Auction Trust invests not only in what happens in the classroom, but also other areas to alleviate barriers to education. When the Lynedoch Primary School was set to close in 2015 a number of organisations and funders stepped in to ensure the children of the surrounding wine farms would have access to world-class education, care facilities and nutrition. The Cape Wine Auction Trust together with the University of Stellenbosch, the Sustainability Institute and Spark Schools have since had outstanding success at the new Spark school, where literacy has improved by 55 percent and maths by 30 percent across all grades. Cape Wine Auction Trust facilitator Andi Norton says that the collaborative approach contributed greatly to the success. 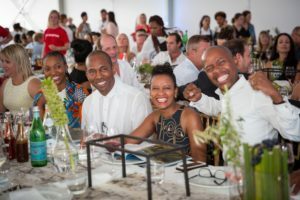 In the case of Spark Lynedoch, as with other beneficiaries, Norton said the Cape Wine Auction’s unique funding model ensured that the money was invested for maximum impact. The network of 22 beneficiaries meet at workshops and collaborate to provide various services to ensure that children in need have access to the best education, care, nutrition and social development from early childhood. Spark Schools offer an individualised learning approach that combines teacher-led instruction with technology-based learning to track and improve children’s progress. “It’s truly world-class,” said Norton, “and by incorporating some of our beneficiaries to complete a full service we are able to offer the children an incredible head-start in life”. In addition to sponsored tuition, the Lunch Box Fund provides nutritious meals and snacks, the Anna Foundation manages an after-school club, social workers and psychologists from Community Keepers give trauma counselling and mental health support, and the Click Foundation offers full-time access to computers and literacy software.